This is where I try really hard not to gush. This week I went to a party at Bloomsbury, held in the honour of the authors of their 11 literary debuts of 2013…and one of them was me! In this pic you can spot Ciarán Collins, Seb Emina (or is it Malcolm Eggs?) and D.W. Wilson. At one point, Alexandra Pringle, madly glamorous doyenne of Bedford Square, declared herself to be a little woozy after having just flown back in from launching Bloomsbury India, but then promptly ditched her heels and stood on a chair to give the most thoughtful and heartfelt presentation of the authors and our books. Surprise! As part of the evening, a booklet anthology of each of the first chapters (or so) had been put together and all the guests got to take a copy home. What fabulous reading for my flight back to France! It is such a privilege and a huge treat to read these extracts, from novels, memoirs and non-fiction books. Honestly, 2013 is going to be a Very Good Year. So, (ahem) I would like to introduce you. Debutants, these are my blog readers. Melissa Harrison (@m_z_harrison) whose novel Clay, we are told, whilst set in the city, has similar echoes to The Night Rainbow: a central child character, an unlikely friendship, a connection to the natural world. The first chapter is so compelling, thank goodness I only have to wait until January. Lara Feigel‘s The Love-charm of Bombs looks intriguing. A chronicle of wartime London as experienced by five writers – driving ambulances, fighting fires and falling in love. the taster already hints at glamour, drama and fascinating insights. Seb Emina (@sebemina) – along with Malcolm Eggs (@malcolmeggs) the editor of The London Review of Breakfasts – whose ‘The Breakfast Bible’ appears, from the extract, to be a work of culinary magnificence. Forget innaccurate and unhelpful egg timers. Now you have…SONGS TO BOIL AN EGG TO. Genius. She Rises by Kate Worsley (@KHWorsley). What Alexandra described as a rollicking novel is vividly descriptive and has such a confident and unique voice. Can’t wait to read the whole book! Servants by Lucy Lethbridge. An original and fascinating portrait of domestic servants in twentieth century Britain. Ciarán Collins (@ciarancollins77) – The Gamal. I never even got to say hello properly to Ciarán, but I’ve read his first few pages and, oh boy. Shades of The Curious Incident of the Dog in the Nightime, but in a bold, irreverent adult voice and the hint of something very dark to come. Set to be a star. Maggie & Me by Damian Barr (@Damien_Barr). I don’t know what I was expecting from the ‘manhattan swigging, chicken loving salonnière’ but it wasn’t this. In the space of a couple of pages I am nine again, as if by magic. I now have a bit of a crush on this man. Ballistics by D.W. Wilson. I only managed the briefest of chats with D.W.: “Do I have to call you D.W.?” “No, my friends call me Dave.” before being whisked off to meet someone else. Pity because I wanted to talk to him about his short story writing. But there’ll be another time I’m sure. Another really fresh voice, but with echoes of American classics, his opening pages grabbed me from the first sentence. June? Seriously? The Bone Season by Samantha Shannon (@say_shannon). You may have heard of Samantha, “suddenly” super-successful whilst still an undergraduate, ‘The next…J.K. blah blah blah”. Let us not forget that people who are “suddenly” successful have practised their writing, a lot, and written an entire novel (at least one, there’s usually a practice novel) and all of this before their “sudden” success. What’s interesting about Samantha is she’s managed to get a book published with Bloomsbury in a genre they don’t usually include in their lists. I bet a lot of fantasy fans will be deeply envious when I say “I’ve read the first chapter and it’s soooo good!” It’s a double edged sword though, as the launch isn’t until August. See Samantha’s take on this party here. Pig’s Foot by Carlos Acosta. As Alexandra pointed out, not only is Carlos one of the world’s greatest ballet dancers, he’s an amazing literary talent. It’s hard not to compare the feel of his narrative to Isabelle Allende or Gabriel Garcia Marquez, but at the same time it’s clear that this story is going to be unique, and uniquely told. A treat coming up in a year’s time. 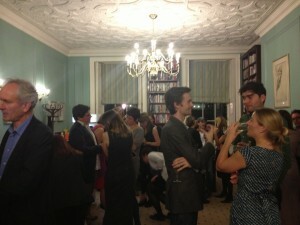 A huge thank you to Jude and everyone at Bloomsbury for organising this fabulous evening. 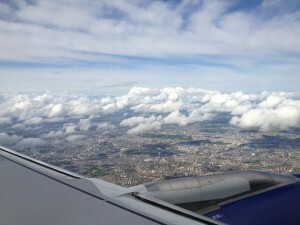 This is a picture of me flying over London. No, I am not in the plane. I am flying over it. I am whizzing and soaring through the clouds. [Ed.] 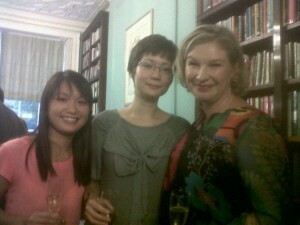 Tess from Bloomsbury just kindly sent me this lovely pic of me with Tram-Anh and Erica. Thank you, Tess! Sounds fabulous – an evening with people who love books. I want to read at least one of the books ‘The love charm of bombs’ right away – who could resist it with Graham Greene and Rose Macauley included in its pages. I can also see that there’s no point in me making my usual new year’s resolution for 2013 (it gets broken every year) not to buy any more new books until I’ve finished the un-read pile. Will Bloomsbury be providing sample chapters on their website to lure people in do you know? 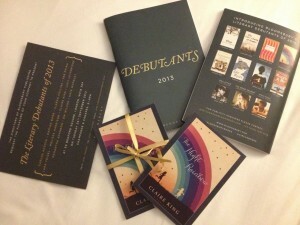 What a fab occasion – good for Bloomsbury making a fuss of all you stars. And your cover looks terrific – great impact. And which month are you?! I’m February – Valentines Day! So proud of you… 🙂 how exciting! Brilliant what a thrill – a very exciting year ahead of you! Thank you! I’m so excited about all the fun things coming up next year. Books, books, books! What a brilliant idea for a party, so exciting for all of you, and great – as a reader – to hear about what’s in the pipeline! Yes, a great idea for a party! Bloomsbury somehow manages to be successful and a ‘big name’ whilst at the same time keeping a real intimacy with authors. I left feeling very supported and energised by it all, and the taster booklet was just the icing on the cake. Such diverse books but all clamouring to be read. Must read faster!